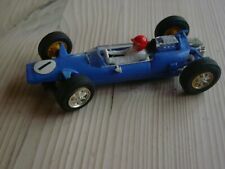 A FRENCH MADE SCALEXTRIC LOTUS IN VERY NEAR ORIGINAL MINT CONDITION. To ensure the models safe arrival. Condition is Used. I try to be as detailed and accurate as possible about every item. A GREAT CHANCE TO OWN THIS MINT IN BOX UNUSED SCALEXTRIC C3506 LOTUS EVORA GT4 No117. LIGHTED FRONT & REAR. GREEN/YELLOW LIVERY. DRIVER THIERRY VERHIEST, FLAT MAGNET, SIDEWINDER MOTOR. 2 KG MAXIMUM OUTSIDE OF UK. This is a used Lotus Evora which is in very good used condition Car is complete with door mirrors, wiper & rear spoiler intact. Body in great condition, still with a nice shine on it. 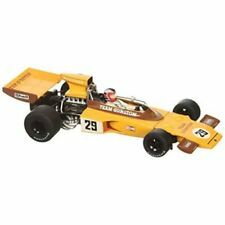 Scalextric Lotus 49 Graham Hill Formula 1 Rare Ltd Edition - 1 of 4000 Boxed New Unrun - Model C3543A. Condition is New - Never Taken out of the box. Have owned from new and then put away - not even displayed. New and boxed, box shows slight signs of wear but all original. 1/32 Scale 'Gold Leaf Team Lotus' Waterslide Decals. Condition is Used. This is a LOVELY Classic Scalextric F1 car, in excellent working order! Considering it's a pre-magnetraction car, it is incredibly grippy! The spoiler is solid, not glued back on and it's very pretty. Super Shells Lotus Elite slot car kit, mint condition. Mint condition, original 1960's, not 100% Complete. SCALEXTRIC LOTUS HONDA/WILLIAMS HONDA F1 CARS - FULLY REFURBISHED - OUTSTANDING! These cars were released by Scalextric as the Formula 1 Set in the 1989 catalogue. The cars have the iconic liveries and were in the Scalextric catalogue in the late eighties. There are no parts missing and both cars are outstanding. Scalextric Sets & Layouts. Scalextric Cars. Pete Lovely, behind the wheel of his Pete Lovely Volkswagen Inc. Lotus 49 started well and qualified in 12th position. However on this occasion success was not to be his, Lovely was involved in an accident on lap 12 and had to retire from the race. 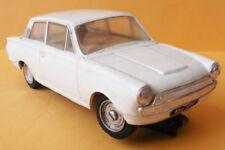 Scalextric LOTUS C/67 RED No 1. TESTED - MOTOR RUNS OK.
1 start light gantry. Support the British Heart Foundation's life saving research. As the UK's number one heart charity, the cutting edge research we fund has already made a big difference to people's lives. Lotus John Player Special 1976? John Player Special from about 1976 in played with condition and will need braids and wires checking over. The paper and plastic have a lot of wear and are a bit 'dusty'. MANUFACTURER REFERENCE: CAR04C. 1:32 SCALE SLOT CAR. FANTASTIC VALUE FOR MONEY. YELLOW/RED #23. CREDIT CARD. It appears to be assembled from a kit (unpainted, and excessive glue) but is presented in a display case as if sold thus. The cardboard mounting is sound and good condition but the clear plastic case, although all present has detached or torn slightly along the edges. Indianapolis Lotus toy racing car for VIP Raceways. Believed to be 1960s and in original box. Some signs of wear to car and box, please see photos for more detail. Not tested and sold as seen in photos, no refunds. UK delivery only. This Scalextric Lotus Evora is in super, unboxed, condition. 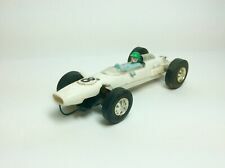 Scalextric Lotus 7 - (C2270). 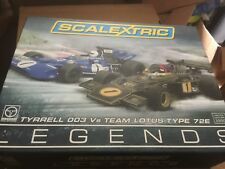 This Scalextric Lotus 7 is in very good, used, unboxed condition.